This movie is stupid. Its tagline is no lie. Seriously. It is also completely crackers with both its content and its gore. If you can’t tell from the title alone, Camp Death III in 2D, is a riotous parody of horror films like Friday the 13th and Sleepaway Camp. Full of really bad jokes (that you will still laugh at) and ample gore effects, this Canadian production is all sorts of frantic fun. It is everything that the Scary Movie series should have been. Sometimes even Jason Voorhees has to have a laugh behind his hockey mask. 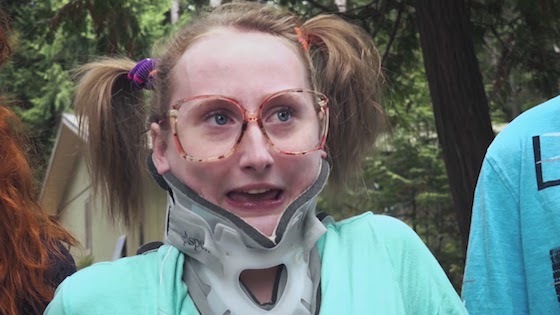 Just make sure your funny bone isn’t broken when you watch. This film is legitimately one of the dumbest films I have ever willingly sat through. 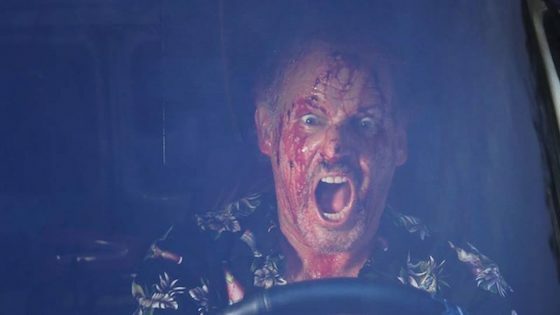 From beginning to end, Camp Death III in 2D never shies away from what it is: a STOOPID movie. And, honestly, it is that dedication to all things witless and fatheaded that makes it a winning parody of horror clichés. Written and directed by Matt Frame (Baghdad or Bust), The Frame Forty Films production stars Dave Peniuk, Angela Galanopoulos and Darren Andrichuk and tells the story of what happens when one condemned summer camp, Camp Crystal Meph, is reopened after being closed upon the death of the killer Johann Van Damme by a very vulgar purple puppet. Don’t worry, the puppet doesn’t dominate the parody, what does dominate; however, is a barrage of creatively twisted kills and a serious dose of madness. Camp Death III in 2D is balls to the wall insane. We even get a fabulously stupid biker chase through the woods à la Return of the Jedi. Hell, even the overacting from all the actors involved in the movie works to create a crazy atmosphere where ANYTHING (like a Star Wars parody in a horror film) absolutely works. I especially love it when the plot holes are addressed and then left to rot. From a toaster to a candy bar, the kills are hilarious and, with one being a plunger, gross. The reopening of the camp brings hilarious stereotyped attendees and that means the masked killer returns, too. And the kill, kill, and kill again vibe is made unique by a face-chomping bloodthirsty squirrel, as well. Is there no safe place in this camp for a teen? Apparently, not. Even the sole police officer takes his own life. It is a hilarious scene where he gives Johann Van Damme tips on the best places to stab his victims. Shot from Van Damme’s point of view, this bloody scene is both over the top and sidesplitting. 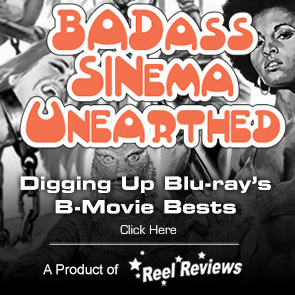 It is that creativity – especially on a very limited budget – that makes this film work. Sure, it is lowbrow entertainment all the way, but it is damn entertaining. Camp Death III in 2D is the type of film that "Weird Al" Yankovic would make if his single film, the cult comedy classic UHF, had been a smash hit and he was allowed to make even more of that madness. I would like to exist in that world. The total insanity on display here has a great swagger and an all-around appealing vibe. True fans of horror will certainly dig their stay at Camp Crystal Meph. Tagline: The Most Horrible Good Movie Ever!. 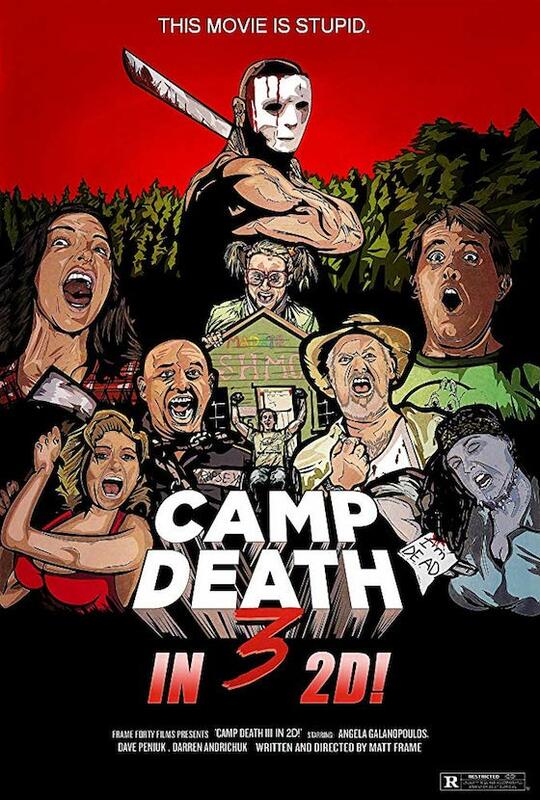 Synopsis: 'Camp Death III in 2D' is a comedy/horror parody of 'Friday the 13th Part III in 3D' and is proudly presented in two dimensions.